Indigo, my Shih Tzu would give Rapunzel a run for her money. They’re a long haired breed which means a lot of maintenance. 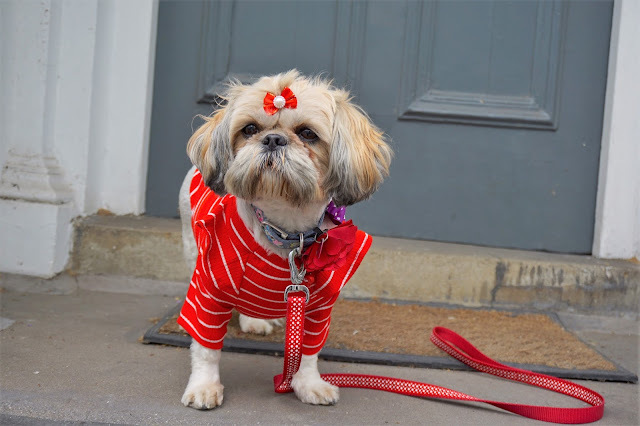 During her little life she’s had plenty of different hairstyles – that’s part of the fun of being a long haired dog owner. Because her fur grows so quickly she goes to the groomers every six weeks. If I leave it any longer, she starts to resemble a stray. While her fur growing skills are impressive, this fluffy little animal seems to get matted all the time. I brush her fur, then she messes it up. A small knot turns into a small mat, which eventually turns into a big ball of matted fur, I cut it out, we start again. You get the picture. 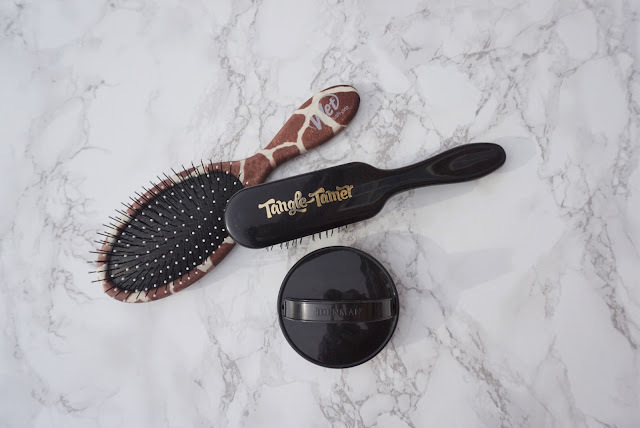 Tangle Tamer by Denman £5 from John Lewis. 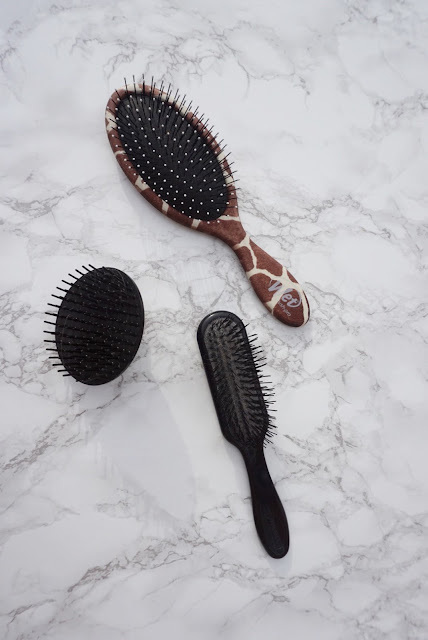 This brush is aimed towards children who have long tangled hair, so it’s bristles are quite soft and don’t pull. I find it excellent to use on Indigo’s tail to make it’s tangle free and silky. As most dog owners know, during a walk your dogs’ tail can accumulate a lot of dirt and debris, I find this brush is excellent for removing whatever has attached itself and making it clean again. I use this on her fur when it’s dry, as it doesn’t remove tangles on wet fur very effectively. Denman Shower Brush £2.27 from Look Fantastic. This little brush is the ideal size to use all over Indigo’s body. The bristles are short and firm, so there’s not a lot of give, making it great for stubborn tangles. She absolutely loves the massage she gets from this, and begs me not to stop. If you have a pampered pooch, I can guarantee they’re going to love being groomed with this. I use this all over when her fur is dry, and on the length of her body when it’s wet. It’s not the most gentle on wet hair/fur, so I only use it on the parts of her body which are clipped short. Wet Brush Pro £8.90 from Just My Look. I’ve got a lot of love for this brush, for both myself, and Indigo. It untangles my hair without pulling, and it does the same for her. Its’ bristles are so flexible they don’t tear through hair or cause damage, so there’ll be no doggy tantrums. Because they’re long and bendy, they’re great on areas of longer fur, such as the ears and tail. There really isn’t a better brush for long hair/fur when it’s wet. I feel like everyone needs one of these in their life, be it for yourself, or your pooch! I’ve got nothing against brushes aimed towards pets, don’t get me wrong, I’m a massive fan of the Furminator. However, on the most part I don’t find them as effective as the brushes above, which are human hair brushes. I find the quality far superior than dog brushes and the price is often a lot better, as you’re not paying a premium for a pet product. I’d love to know your thoughts, and any recommendations if you think there’s a better brush out there.